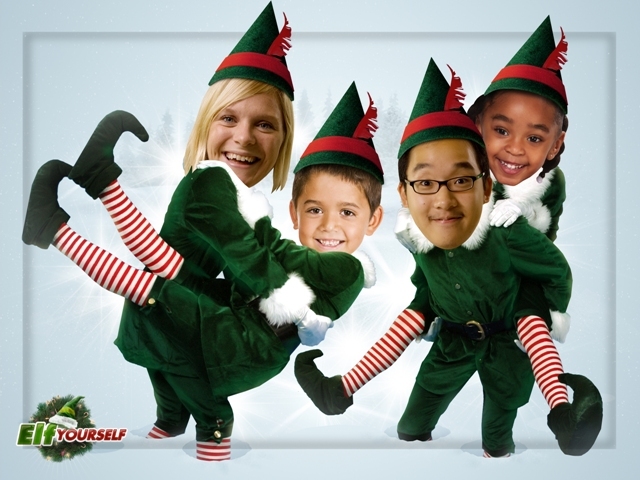 Elf Yourself has officially launched today!!!! If you have ever wondered what you would look like as one of Santa's little helpers¬† all decked out in striped leggings, a tunic and the perfect hat - this is your chance to find out! Elf Yourself has been around since 2006 and has proven to be a viral marketing success for Office Max! We are sure this year will prove no different! The software is incredibly simple to use and this year features a Facebook app that allows you to pull in 5 images, several options for sharing your video and a variety of gift ideas that you can have your image put on.¬† Some of the products include snowflake ornaments, mugs, greeting cards, blankets and more with prices ranging from $4.99 - $89.99. This would surely be a gift we can all enjoy! And of course what would this post be without my own little elf? Hmmm, this may be the first time I posted my own pic on this blog.....so here you go, my wonderful family as Santa's elves! We hope you will make this a new holiday tradition in your home, I know we get a kick out of it every year!